SO we leave for Vaca on Friday and we are flying in to the San Jose Airport and it just so happens that the Winchester Mystery house is close by, 12min to be exact!! SO I have talked Matt into a tour before we head on to Monterey which is only 1 hour away! 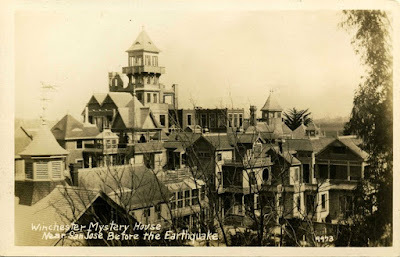 If you don’t know the history surrounding this bizarre home I will give you the jest… Sara Winchester is the heir to the Winchester Rifle fortune and she felt like the spirits from all those killed by her rifles haunted her in the home, so she was told by a “spirit” to never stop building and thus the mystery home began. This home includes rooms with no doors, stairs leading to no where and even a room where she contacted the spirits in an attempt to please them. 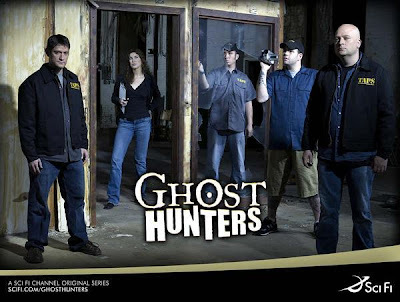 She built on to the home everyday until she passed AND it just so happens to be one of the most haunted locations in the US and my beloved Ghost Hunters have even filmed there!!! So you know I am excited! You can be sure I will take as many pictures as I can, I only wish I could take a night tour!!! That place sounds amazing! I can't wait to hear your spine tingling stories!!! your a dork!! but SO cool! have fun and be careful!